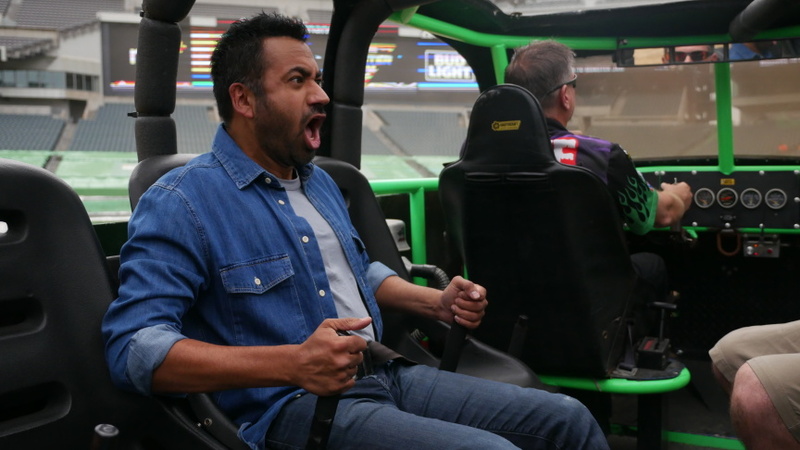 Kal Penn knew nothing about the world's economic systems when he was asked to host the new show This Giant Beast That Is the Global Economy, now out on Amazon Prime. At least that's what he told creators Adam McKay, director of The Big Short, and Adam Davidson, co-founder of NPR's Planet Money podcast. McKay and Davidson said to him, "But you worked at the White House," Penn told the Frame. His reply to them: "OK, come on, not on the economic team." In the early days of the Obama administration in 2009, Penn famously stepped away from his acting career — which included a recurring role in the show House and his starring turn in cult stoner classic Harold & Kumar Go to White Castle — to work in the White House. He joined the Office of Public Engagement until 2011, leaving briefly in 2010 to film the third installment of the Harold & Kumar franchise that made him famous. But McKay and Davidson insisted that Penn was exactly the kind of person they wanted to host This Giant Beast: someone who is curious about the economy, but doesn't have a firm grasp on the details. "I realized they were calling me stupid, which was fair," Penn joked. "Basically they wanted a host whose lens would be the same lens as the audience." "I'M PLAYING A CHARACTER NAMED KAL PENN"
Penn sees This Giant Beast as a hybrid. "This is not a documentary, and this is not a reality show." He hesitated to call it journalism. "I am not a journalist. I'm sort of a curious actor." But even Penn admitted that he walks right up to the line of what a journalist does. He gave the example of Humberto Aguilar, a former cocaine money launderer who he interviews in the series. "I wasn't expecting him to smile — with his amazing mustache, by the way — and so fondly recall what it was like laundering money through prostitutes in the '80s in Miami ... I just wasn't expecting the sense memory in his face to show," Penn said. "I read the New York Times cover to cover every day. I can't imagine what real journalists have to go through to get these stories." Still, Penn saw his experience as an actor as an asset. "I'm playing a character named Kal Penn." "OUR LIVES ARE EMOTIONAL AND WE CREATE EMOTION"
Each of the eight episodes covers a different topic related to the global economy — including money laundering, cryptocurrency, and futures trading. Penn said he had no idea how blockchain worked until two months before shooting the episode on cryptocurrency. He thought he had a handle on futures — until he saw the explainer for it, starring singer Meghan Trainor. McKay used a similar device in The Big Short, with Margot Robbie explaining subprime mortgages. Penn said that, as an actor, Trainor's explainer made the topic of futures easier to understand. "Our lives are emotional and we create emotion," Penn said. It gave him context for understanding people he interviewed who he didn't find sympathetic at first. "It was kind of tough to have to be mature there and to say, OK, I need to find out more information about this. I can't just sit here thinking, this guy is the enemy. We're used to thinking in polarizing terms." "THIS COULD COMPLETELY DECIMATE THE GLOBAL ECONOMY"
This Giant Beast doesn't offer a lot of solutions — Penn recognized this. "The point was to pull back the curtain a little bit and empower the audience to understand how we interact with the things we depend on." The eight episodes cover what seem like micro-level topics — rubber, artificial intelligence, counterfeiting — but in a way that connects them to the macro-level big picture. Penn gave an example: "This issue of leaf blight," he said — referring to a symptom of plant diseases that could threaten rubber trees — "even people who study it were not particularly alarmed by it." That's because, to be considered a serious problem, blight would have to be carried between global destinations that currently have no direct connections, like as Brazil and Thailand. But one scientist he spoke to felt that people were ignoring a real issue. The market might create those direct connections someday. "And this could completely decimate the global economy," she told him. Her message: Just because it's not a problem now, doesn't mean it won't become a problem someday. Penn knew This Giant Beast would gel with his generally-positive worldview, and that he would get to discover the best in people. But he didn't expect the ways it would challenge him. "I didn't realize the sardonic tone that I think the Adams brought to it," referring to McKay and Davidson. "It's nice to work on a show at a time where we're not questioning the validity of what we're looking at," Penn said. "We're just questioning our interaction with the material. How much agency do we have over these things? And how can we change the system for the better?" If This Giant Beast is any indication, the first step to change is the desire to change. This Giant Beast That Is the Global Economy is now streaming on Amazon Prime. Listen to this interview on KPCC's The Frame podcast.